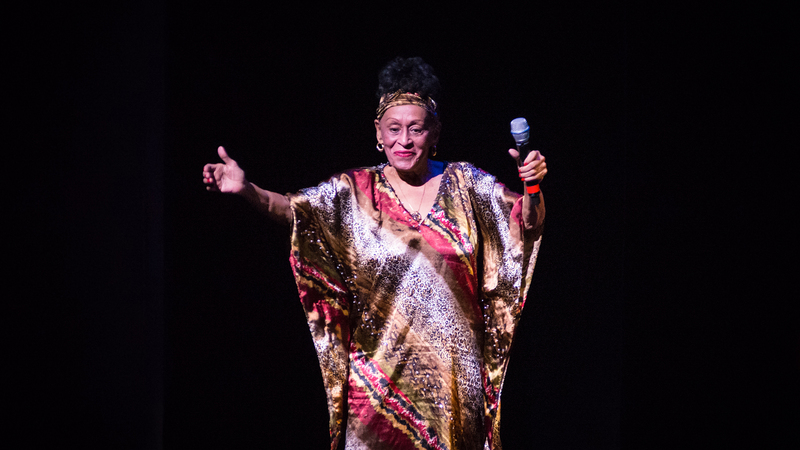 With over 20 albums under her belt, you'd think more people would have heard of iconic Cuban singer and dancer Omara Portuondo—especially since she has collaborated with the likes of Julio Gutiérrez and Chucho Valdés, and was part of the famous female singing group Cuarteto d'Aida. If you're not familiar with bolero, jazz, or son cubano styles of music, don't beat yourself up for not recognizing "Omara Portuondo" as a household name. If you do, then there's a good chance you know the words to "Chan Chan" by the Buena Vista Social Club project, of which Portuondo has been a part of since 1996. The project—a worldwide music tour in honor of an infamous, actual membership club in Havana called the Buena Vista Social Club—features some of the original members who once performed there, and is still hitting stages today. Recently, the 15 musicians who makeup the current project known as Orquesta Buena Vista Social Club came to perform just outside New York City in Newark, NJ on October 15. We were there to catch these incredible musicians keeping the music of 1940's Havana alive.